The Nissan Leaf is often billed as a vehicle that could help signal the end of the internal combustion engine. Why? Because it’s an affordable, practical electric car that doesn’t have outlandish styling! 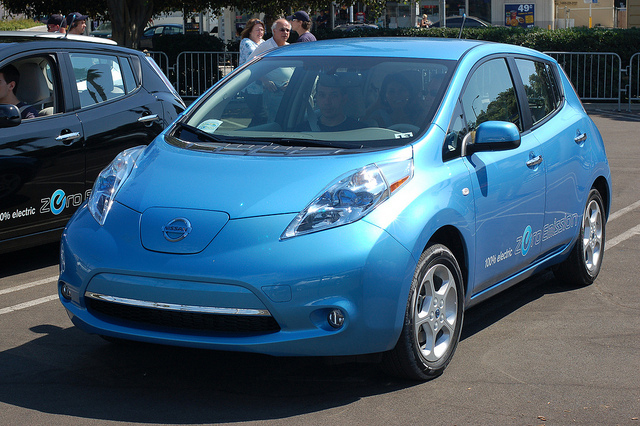 One of the biggest selling points of the Nissan Leaf is that it’s a pure electric vehicle. Most car makers seem focused on building petrol or diesel hybrids. If you want a real eco-friendly car, the only practical choice is to go down the electric route. Others like hydrogen cars cost too much to buy, and the infrastructure is almost non-existent. At least, it is if you live outside of California and Japan! Let’s face it; you don’t get a huge range out of a full charge with the Nissan Leaf. In fact, you’re lucky to get 120 miles on a good day. But then, most cars in this category seldom venture out to other far-away locations. People buy small hatchbacks because they want a capable car for driving around their local towns and cities. Don’t get me wrong though; it is possible to go on long journeys with the Nissan Leaf. You just need to make a few stops to recharge the car’s batteries. The good news for people worried about “range anxiety” is that the public charging network is growing. Most places offer fast DC chargers. That means you can achieve an 80% charge in just 30 minutes. Otherwise, you have to wait eight hours for a full charge. According to Roger at the Pentagon Group, people worried about the prices of new EVs need not get concerned with the Nissan Leaf. Even 12-month-old models are affordable to the masses. I know that we’re not talking about an electric vehicle as expensive as say the Tesla Model S.
But, some motorists have tight budgets and cannot afford to spend the cash on going green! That makes the Leaf an attractive proposition to such drivers. Other car makers like Renault lease their batteries in an effort to make their EVs more affordable to customers. Nissan has traditionally steered clear of battery leasing. Now, it seems, they have taken a u-turn on their policy because of customer feedback. What that means for new or used Nissan Leaf buyers is that there’s never been a better time to get this vehicle. Compared with an outright purchase, leasing a battery is the most cost-effective option. Especially as customers are likely to upgrade their cars in a few years for the next newest models. So, when will you be getting your Nissan Leaf?